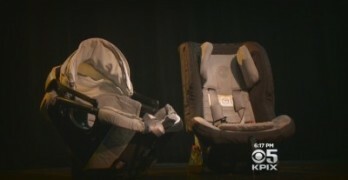 What began as a NewsMom editorial, expanded into a six month KPIX-CBS investigation exposing alleged false advertising, apparent legal loopholes and outdated federal regulations that systematically expose millions of children to concerning car seat chemicals. First, we established that even the greenest child car seat manufacturers, who pledge to avoid the most concerning flame retardants, have been unable to keep retardants that are “known to cause cancer” out of their car seats. Then, utilizing biomonitoring, we investigated an apparent link between high levels of a cancer-causing flame retardant in a child’s body and the same flame retardant in her car seat. Years of research similarly link the chemicals in furniture and baby products to flame retardants in babies and breast milk. Now, we’ve revealed that the 44-year-old federal flammability standard, which manufacturers say ostensibly requires chemical flame retardants in car seats, has never even been tested in car seats, and regulators admit there is no data to indicate the standard provides any real-world safety benefit in car seats. Fire scientists contend that the federal flammability standard, and flame retardants added to car seats as a result, are irrelevant for real-world fire safety. So, we did what the regulators never have; we commissioned a combustion test and lit car seats on fire. The results shocked even the critics. Below you’ll find a summary of each of our stories to date, followed by additional data and information that may be of interest to the parents, journalists, lawmakers, industry groups, health advocates, fire scientists, consumer groups and, of course, regulators who are following the issue closely. NOTE: This is a working document and may be updated with additional information and links. #NewsMom Note: Car seats in cars save lives. None of this information should be interpreted to imply otherwise. The safest place for a child in a moving vehicle is in a rear-facing car seat in the middle of the back seat. View the national story on CBS This Morning here. 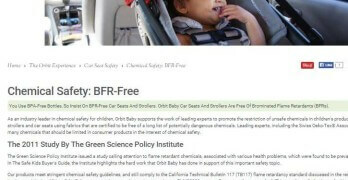 In our initial report, we exposed alleged false advertising and established that even the “greenest” car seat companies have been unable to keep flame retardants that are “known to cause cancer” out of their car seats. 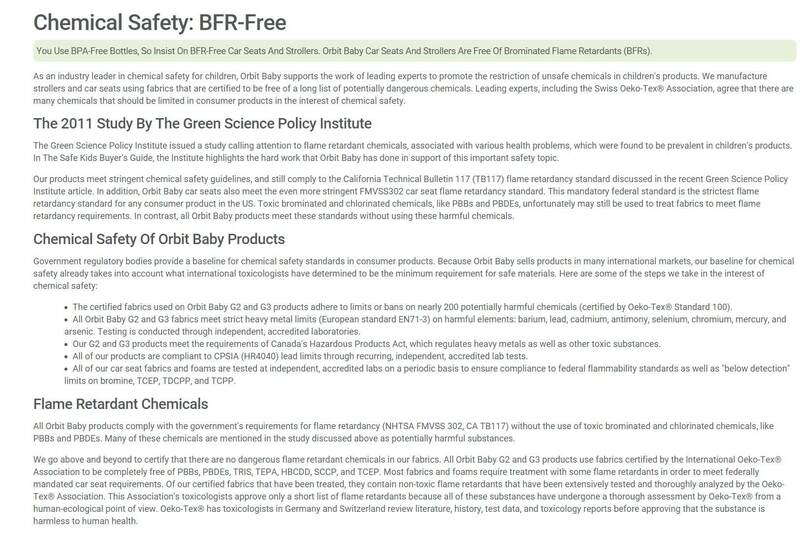 Orbit Baby claimed its materials were tested to ensure “below detection limits” of “dangerous flame retardant chemicals” including TDCPP (Chlorinated Tris). 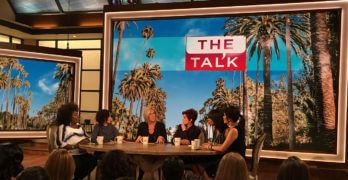 That chemical was removed from children’s PJs in the ’70s due to health concerns and is on California’s list of known cancer-causing chemicals. In spite of the company’s claims, we repeatedly found Tris (TDCPP and TCPP) in Orbit car seats. View, share & comment on the Facebook video here. In part 2, we revealed that several manufacturers have been served with violations for selling car seats with flame retardants like TDCPP, but without the required warnings. State law requires that any product with “chemicals known to cause cancer, birth defects and reproductive harm” come with a warning label at the time of purchase. As a result of our investigation, the Center for Environmental Health filed legal action against Orbit Baby, which was was believed to be the only one of those companies to specifically advertise that its products did not contain the concerning chemicals in question. In part 3, we demonstrated that what is in the car seat may end up in the child. A biomonitoring study found high levels of the the flame retardant TDCPP in a child’s body — the same flame retardant found in her car seat. While using her car seat, the levels of TDCPP found in her body were more than eight times the average for children tested in previous studies. 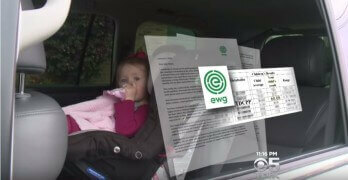 Follow up tests revealed that her levels were near average after eliminating exposure to her car seat. 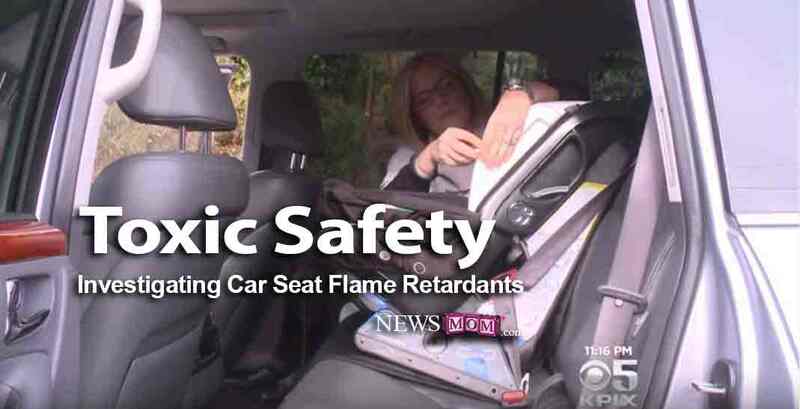 As a supplement to the KPIX story above, the NewsMom Editorial “How I Discovered a ‘Cancer-Causing’ Flame Retardant In My Child and Car Seat” details the backstory of the biomonitoring study. “Toxic Safety: Resources for Parents” provides additional useful resources for reducing exposure to flame retardants in car seats. Fire scientists contend that the federal regulation, which ostensibly requires chemical flame retardants in car seats, is irrelevant in a modern day car fire. 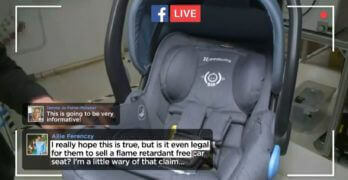 The investigation revealed that the 44-year-old federal flammability standard has never even been tested in child car seats, and regulators admit that there is no data to indicate the standard provides any real-world safety benefit in child car seats. In fact, no one from more than a dozen applicable government agencies or industry groups could provide any evidence that flame retardants in general offer a safety benefit to a child in a car seat. An analysis of nationwide car fire data and public records further demonstrated that regulators were citing car fire statistics out of context in an effort to defend the untested standard. Finally, we did what the regulators never have. We commissioned combustion tests to gauge the effectiveness of the federally mandated flammability test in car seats. The test demonstrated that car seat samples without flame retardants performed as well, if not better, than those with flame retardants. Chemical flame retardants, widely used in consumer products, have been repeatedly linked to cancer, developmental delays and various other health issues. Researchers say children are most at risk. While some newer versions of flame retardants are believed to be safer than others, scientists like Blum point out that many of the older chemicals, now known to be mutagens, were also once believed to be safe. There is currently no requirement that retardants are proven safe before they are introduced into consumer goods. 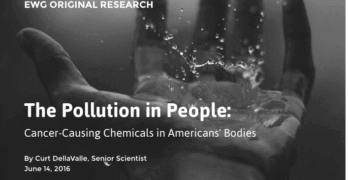 The World Health Organization finds nearly 1 in 5 cancers are caused by chemicals and other environmental exposures. As the Environmental Working Group points out, antismoking efforts “have cut the rate of lung cancer by more than 25 percent in the last 25 years.” Many environmental scientists believe that reducing the number of untested and known carcinogenic chemicals in our kids’ environment could help do the same for cancer rates overall. The Consumer Product Safety Commission banned a flame retardant known as Tris (TDBPP) from children’s pajamas in the 1970s after researchers discovered it was a mutagen, later linked to cancer. It was replaced with a different form of Tris (TDCPP), now also linked to cancer, that pajama manufacturers later voluntarily removed. However, decades later, that same chemical is now commonly found in car seats. In fact, a recent technical report found forms of Tris and other concerning chemicals in 75 percent of the car seats tested. Our investigation also examined an apparent link between high levels of TDCPP in a child and the same chemical in her car seat. The levels of TDCPP in my body were 3.8 PPB (parts per billion). The average child in previous studies had between 5-7 PPB in their bodies. My daughter’s levels were 60.8 BBP! 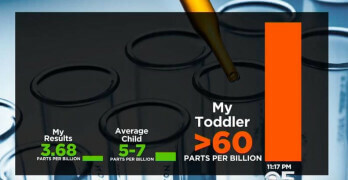 Twenty-four hours after the car seat was removed (later replaced), her levels were just above the average in children tested for previous studies, 8.68 PPB. Ten days later, they were below average at 4.25 PPB. A follow-up sample was taken 10 days later in an attempt to confirm that there were no other significant contributors in our home. The fact that she still tested positive for 4.25 PBB speaks to the fact that these chemicals are pervasive in consumer products and the environment. There is currently no realistic way to eliminate exposure short of updating regulations. However, parents can certainly try to reduce kids’ exposures. Toxicologist stress that the lower the exposure, the lower the risk. Decades of research similarly link the chemicals in furniture and baby products to flame retardants in babies and breast milk. The Environmental Working Group also recently linked high levels of the chemicals in kids to “misguided regulations” that encourage adding chemicals to consumer goods. Due to the serious health concerns, groups including the American Academy of Pediatrics are now calling on the CPSC to outlaw certain flame retardants in children’s products by invoking authority it rarely uses without a direct order from Congress. However, the CPSC has no jurisdiction over car seats, which must adhere to the National Highway Traffic Safety Administration’s (NHTSA) Federal Motor Vehicle Flammability Standard, FMVSS 302. To understand the issue of flame retardants in car seats, it helps to have a basic understanding of the history of the chemicals in all products containing foam. The average American baby is born with 10 fingers, 10 toes and the highest recorded levels of flame retardants among infants in the world. Two powerful industries — Big Tobacco and chemical manufacturers — waged deceptive campaigns that led to the proliferation of these chemicals, which don’t even work as promised. This Tribune investigation looks at how the industry has used deceptive tactics to convince the public they’re needed. 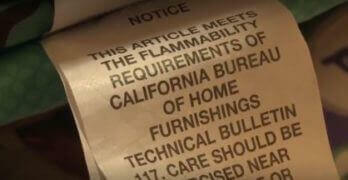 The widespread use of flame retardants in furniture and baby products is due largely to a 1975 California flammability regulation, TB-117. It ultimately set the standard for the rest of the country because most manufacturers would not make one product for California and another for everyone else. The standard utilized an easy-to-replicate burn test that didn’t require manufacturers to set the actual furniture on fire, which would have been very expensive. Instead, TB-117 required they expose the foam inside the product to a candle-like flame. Adding pounds of chemical flame retardant to that foam was the most cost effective way to pass that test. However, like car seats, couches aren’t made of foam alone. In a real fire, the fabric on the outside of a product ignites first. Federal researchers found that once the fabric was ignited, the flame was too big for the fire-retardant foam underneath to be effective. Following decades of research into health concerns and fire science, TB-117 was recently revised. 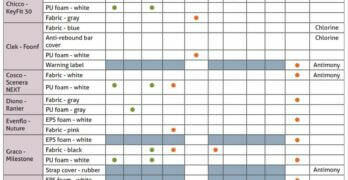 The new TB-117-2013 can be met with smolder-resistant fabrics or a barrier fabric between the foam and the fabric. 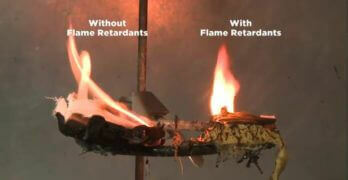 Flame retardants are not needed. Similar to the old furniture flammability test, the motor vehicle flammability standard FMVSS 302 does not require car seat manufacturers to set a whole car seat on fire. Instead, each individual component of the car seat must pass the 44-year-old flame spread test. A 1.5 inch flame is applied directly to a sample of each material, including inaccessible components like interior foam padding. The flame cannot travel more than 4 inches in one minute. FMVSS 302 applies to anything manufactured for the interior of a vehicle, including the dashboard, the floor mats, the driver and passenger seats and after-market items like child car seats. Though, car seats weren’t common when the law was introduced and were not required in all 50 states until more than a decade later. 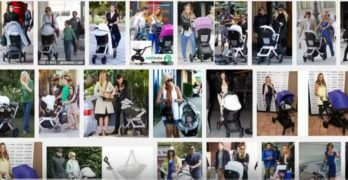 They are now also commonly used outside of the car as stroller seats, swing inserts or sleeping surfaces. Child car seats are currently the only consumer product required by law in every state, and as a result of the federal standard, there is not a single car seat on the market without chemical flame retardants. While the standard does not specifically require flame retardants, and some outer car seat fabrics are naturally flame resistant, car seat manufacturers contend that they must add flame retardants to the foam padding inside the car seat in order to pass the test. According to the Juvenile Product Manufacturers Association (JPMA), alternative materials that may meet the standard without added flame retardants would be too expensive to mass-produce and would therefore be unaffordable for most parents. FMVSS 302 has not been updated since it was introduced in 1972, three years before the controversial (and now revised) furniture standard. Fire scientists, like Dr. Vyto Babrauskas, contend that the current flame-spread test requirements, and flame retardants used to pass it, are irrelevant in real-world car fires unless a car fire is ignited by a small flame applied directly to naked foam inside a child’s car seat. Babrauskas, formerly the head of furniture fire research at the National Institute of Standards and Technology, says that a fire ignited anywhere else in a car would be fueled by combustible materials and too big by the time flames reached the car seat for retardants to provide any added benefit. He also points out that it would too late by the time they reached the foam inside the fabric and under the child. “In a modern-day car fire, by the time the interior ignites, it is already an inferno and there are no chemical means that can protect against that. Furthermore, the current standard for the interior of the child’s car seat only tests flame spread if you were to rip open a car set and hold a small flame against the foam. While the traditional polyurethane foam used inside car seats is flammable on its own, in a real world fire, the foam is covered by fabric. Fire scientists contend that once the fabric ignites, the fabric flame would be much larger than the test flame. 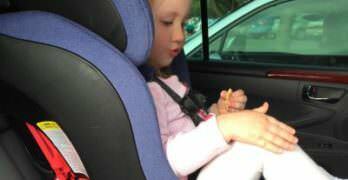 The agency believes that there are situations where the (car seat) could become ignited. 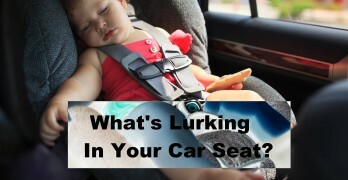 One example is children in the back seat of a car, playing with matches, a cigarette lighter, or other ignition source near a child restrained in a Fisher-Price seat. In response to our investigation, NHTSA admitted that it has never evaluated the effectiveness of the federal motor vehicle standard in children’s car seats. The agency also said it was unaware of any records, data or studies that indicate the current flammability standard is relevant or provides any fire safety benefit in a child’s car seat. In fact, we reached out to more than a dozen government agencies and industry groups, and no one could provide any evidence. NHTSA cites data from the U.S. Fire Administration in defense of the standard, stating that about 194,000 car fires occur annually, resulting in more than 200 deaths, about 20 of them children. This is similar to data cited by the chemical industry in defense of flame retardants in car seats. However, a review of that data indicates regulators are citing it out of context, as those statistics include all vehicle fires, including freight, construction vehicles and car fires that were intentionally set. Fire scientists point out that none of those fires are relevant to preventing unintentional flame spread in a child’s car seat. They reiterate that the federal flammability standard is only intended to slow the spread of a small flame that is first ignited in upholstered material. 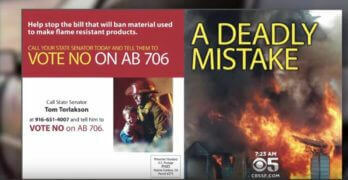 According to additional data that KPIX 5 obtained from the National Fire Protection Association, only 3 percent of unintentional car fires began in upholstered material, resulting in fewer than three total deaths per year, not necessarily children. There is no indication that any of those fires were first ignited inside a child’s car seat. According to the most recent available car fire data, children under 5 (car seat age) account for 2 percent of all civilian deaths and injuries (combined) due to vehicle fires. The data does not indicate whether any of those fires were first ignited in fabric and therefore relevant to the standard. Again, fire scientists argue that flames ignited anywhere other than in the car seat itself would be too large for flame retardants in the car seat to be effective. According to more than a dozen relevant government agencies and industry groups, there is no known data that indicates the effectiveness of flame retardants in car seats or the number of children who safely escaped from car fires. Data we compiled from the National Fire Protection Association though the National Fire Incident Reporting Systemalso indicates that automobile fires have steadily declined on their own since 2002 without a change in the standard. Fire scientists contend this indicates that external factors, like better crash prevention and fuel system designs, are likely leading to the decline. This is a rare case where the manufacturers and the green scientists agree on changes to a regulation. 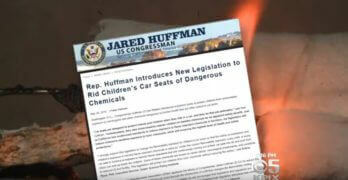 Both believe that car seats should be exempted from the current flammability standard, or that NHTSA should update the standard to better allow for car seats without flame retardants. However, while green scientists contend that chemical flame retardants are harmful to children, the Juvenile Products Manufacturers Association (JPMA) simply questions whether they are necessary in car seats. FMVSS No. 302 does not specify the application of chemical flame retardants… Instead, [it] is a performance-based test that evaluates the burn rate of materials in vehicles and on car seats. The agency believes it is possible to comply with FMVSS No. 302 using materials that do not pose long-term health risks. 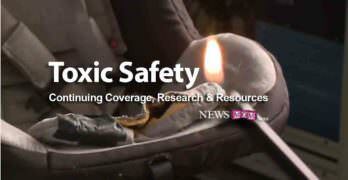 In order for car seat manufacturers to meet the current flammability standard, chemicals are necessary. JPMA is not taking the position whether or not they’re good or bad but whether there could be an alternative test so that chemicals would not need to be used in order to meet a flammability standard. With the help of combustion scientist Don Lucas and the Lawrence Berkeley National Laboratory, we did what the regulators never have; we lit car seats on fire to test the standard. In addition to igniting large portions of fully assembled car seats, we conducted a side-by-side comparison burn of two car seat covers, one with flame retardants and one without. One sample was taken from a car seat that does meet NHTSA’s FMVSS No. 302. We tested the foam inside to ensure it contained an average amount of flame retardants (specifically TDCPP). The other sample was an aftermarket organic car seat cover, originally purchased on ETSY. Instead of foam, the interior padding was made of organic wool. Despite the common belief that organic wool is naturally flame resistant, the naked wool in this particular aftermarket car seat cover appeared to be highly flammable on its own when exposed to an open flame. While a small sample of the foam burned comparatively slowly and melted, a small sample of naked wool ignited and incinerated in less than a minute. However, in a car fire, the interior padding is covered by the car seat fabric. Some fabrics are naturally flame resistant without chemicals and fire scientists argue that once the fabric ignites, the interior padding is irrelevant. That is essentially what our test found. When we lit the car seat samples for a second time, this time leaving the organic wool and the FR-treated foam covered in their respective car seat fabrics, we got entirely different results. Side by side, with the fabric and foam combined, as they would be in a real-world fire, the flame-retardant-free sample seemed to perform better. “Looking at the amount of smoke production and fire propagation, I think the one without flame retardants (preformed) a little better,” said Lucas, noting that the sample with flame retardants was dripping flames and producing a thick black smoke. By comparison, the flame-retardant-free sample took longer to ignite, burned slowly and produced less smoke. NHTSA believes there is a safety need to control how quickly flame can spread to afford time for caregivers to help their children escape the vehicle in the event of a fire. For this purpose, child seats, like motor vehicle seats, are required to prevent flame spread. However, at least one type of quick-release car seat technology called the Child Safety Seat Emergency Harness Release System (EHRS) was developed and patented nearly a decade ago. 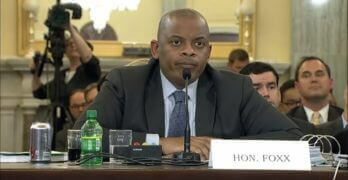 The owner of the patent, Michael Blackmon, says he met with NHTSA in 2008. As a result of that meeting, Blackmon says he reached out to several car seat manufacturers, but they told him they weren’t interested in testing the technology because NHTSA does not require that car seats allow for quick release in an emergency. Since then he says he’s heard from parents across the country who’ve struggled to get their children out of a car seat in an emergency. In several cases, the child drowned when a car rolled into a lake or body of water and the parents were unable to get the child out of a car seat. Amy Basset-Brevik was one of those parents. She reached out to Blackmon after she and her husband struggled to get their twin daughters out of their car seats in a fire. 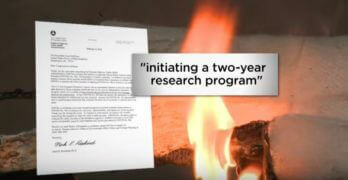 The Minnesota mom said flame retardants in her children’s car seats were irrelevant in the face of the giant flames. The bigger issue was the inability to quickly remove her kids from the seat as her clothing began to catch fire. She began petitioning NHTSA and car seat manufacturers three years ago to get the quick-release technology on the market. “There needs to be a change,” she insists. To our knowledge, there is currently no car seat on the market with an emergency release quick release option. There is also no indication that any car seat company or regulator is currently testing a car seat emergency release option. Following a recent story about children drowning in cars, we reached out to NHTSA to ask if the agency had researched or considered encouraging quick release technology in car seats. The agency said it needed more time to research an answer to our question. 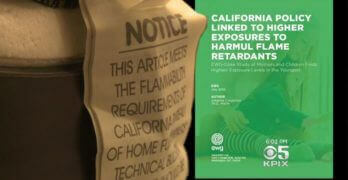 Flame retardants provide an important layer of fire protection and can help save lives. This is particularly true when it comes to vehicle fires, which still pose serious risk to Americans. According to the National Fire Protection Association, U.S. fire departments responded to an average of 152,300 vehicle fires per year between 2006 and 2010. These fires caused an average of 209 civilian deaths, 764 civilian injuries, and $536 million in direct property damage. It’s interesting to note that NHTSA cited similar statistics in its statement. Also notable is the fact that the data also indicates that nearly 16,000 of those fires were intentionally set. Of the of non-intentional car fires, only 3 percent were first ignited in upholstered material (vehicle seats), and there is no indication that any of those fires ignited in a child’s car seat. The U.S. Centers for Disease Control and Prevention reports that motor vehicle crashes and fire- and burn-related injuries are among the most common causes of unintentional injuries leading to death among children. It is for all of these reasons that the U.S. Department of Transportation maintains fire safety standards for flammable materials in vehicles. To clarify, the CDC data does not indicate any of the motor vehicle deaths were a result of car fires. Additionally, the burn-related injures that the industry cites are in reference to all burn injuries, unrelated to cars. In fact, the NFPA data indicates that car fires ignited in upholstery resulted in fewer than three deaths per year – including people of all ages. Flame retardants and other safety materials used in car seats and in other parts of the vehicle can help stop fires from starting or delay their spread, providing people with additional valuable escape time. Every additional minute matters when vehicle fires can quickly start, sometimes on impact. Over the past year, there have been numerous car fires in the San Francisco area including last week’s fatal car crash near Livermore when one of the cars burst into flames on impact. In addition to other fire safety tools, flame retardants are necessary in providing comprehensive protection against fires. Flame retardants, like most chemicals, are subject to review by the U.S. EPA and other regulatory agencies around the world. Consumers do not have to choose between chemical safety and fire safety. They can have both. 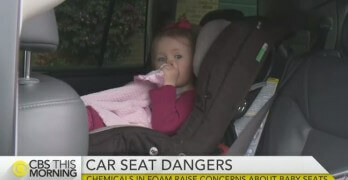 The EPA tells us it “is concerned about flame retardant chemicals” and recently “conducted an evaluation of chemicals that could be used as flame retardants and identified a number of flame retardant chemicals that should be priorities for risk assessment.” Many of the concerning chemicals listed by the EPA are commonly used in child car seats. They contend, as the evidence cited above implies, that the flame retardants added to pass the current federally mandated test do not provide significant additional protection for children from real-world car fire flames. There is no known evidence to contradict that assertion; however there is extensive evidence of the health risks associated with the chemicals used to pass the test. Several years ago, I began suffering horrific migraine headaches. The headaches seemed to be related to my bed/bedroom, but I could make no sense of their sudden onset. 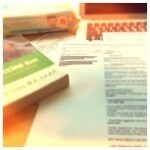 After two visits to the ER, I was given medication for the headaches, but still no answers. Soon thereafter, I went out-of-town for a week and, much to my delight, not a single headache. On my first night back at home, I thought my head would explode. It was then that I became CERTAIN the headaches were, indeed, related to something in my bedroom, but WHAT? Then…it occurred to me that the only thing that had changed in my environment was that I had bought new, expensive, wrinkle-free sheets for my bed. (FYI: They had been laundered many, many times.) When I researched what was involved in the anti-wrinkling of fabric, I found that it was a CHEMICAL PROCESS that included treatments with many chemicals, including formaldehyde!! I removed those dastardly linens from my bed and replaced them with my original ones. I haven’t had a headache since…!!! Super interesting. Thanks for sharing. This is disturbing beyond words. I care for my 4 grandchildren at different times (all under the age of 4), and drive them all around town. 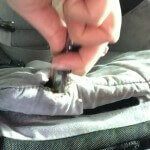 Is there any carseat approved in the US that doesn’t have flame retardant chemicals or one that doesn’t have as much as others? This post has Resources for Parents (and grandparents 🙂 on how to reduce exposure and find car seats with “safer” chemicals. Unfortunately, there are not any car seats without flame retardants. But you’ll find a link to the Ecology Center’s testing here which lists a couple car seats that had “better versions” flame retardants.